All resources proponents, investors and financiers. A new financial provisioning scheme commences on 1 April 2019, which affects the manner, form and calculations of financial provision to be made by EA holders in Queensland. Assess your likely 'Estimated Rehabilitation Cost' and 'Risk Allocation' and seek advice in order to prepare for your first entry into the new scheme. Passed in late 2018, the Mineral and Energy Resources (Financial Provisioning) Act 2018 (Qld) (MERFP Act) overhauls the current financial assurance (FA) and progressive rehabilitation regime for resource projects. The Act will come into effect in two phases – first, the transition to a new financial provisioning scheme commences from 1 April and, in the second half of 2019, the start of a regime imposing new procedures and obligations relating to progressive rehabilitation and mine planning. In this article, we provide an overview of the new financial provisioning scheme. Some details remain to be finalised – for example the considerations to be taken into account by the new statutory decision maker ('Scheme Manager') – and we will address those critical issues in further updates about preparations that proponents should make before entering into the new scheme. We will also review the new progressive rehabilitation regime in future articles. a one-off surety, which includes the existing options of cash or bank guarantee, but now includes the opportunity to satisfy financial provisioning by providing an insurance bond. whether a surety is required from the EA holder to preserve the financial viability of the pooled fund. Parts of the scheme will continue to be administered by the Department of Environment and Science (DES). For example, DES will be responsible for making the ERC decisions. However, administrative responsibility for many other aspects rest with Queensland Treasury. Specific decisions, for example the risk allocation decision, will be made by the Scheme Manager. rehabilitating land, conducting remediation activities, and conducting research that may contribute to rehabilitation of land, associated with abandoned mines. The Scheme Manager's risk allocation decision will determine whether or not an EA holder will be required to contribute to the pooled fund or provide a surety (for the full ERC amount), and the percentage contribution the holder will be required to make to the pooled fund. Note that an entity with a sum of their total ERC for their EA(s) that exceeds the fund threshold (currently set at $450 million) will be required to contribute to the fund for their ERC up to the level of the threshold and provide surety to the scheme manager for the ERC amount in excess of the threshold. The new scheme was under consideration throughout 2017 and 2018, and was the subject of extensive engagement between various government bodies, industry and other organisations with a stake in environmental management (see " Parliamentary Committee recommends that the FA Bill be passed" and " Balancing the need for financial secrecy in resource plays and the desire for government transparency"). Until recently, there has been uncertainty as to how projects will be allocated to a risk category by the Scheme Manager. On 1 March 2019, Queensland Treasury released a revised suite of information sheets and draft guidelines. Although these will not be finalised until the Scheme Manager is appointed from 1 April, the revised guidelines go a long way toward clarifying how an initial risk allocation will be made by the Scheme Manager. Our diagram below summarises the factors the Scheme Manager will consider in allocating a risk category to a resources project. 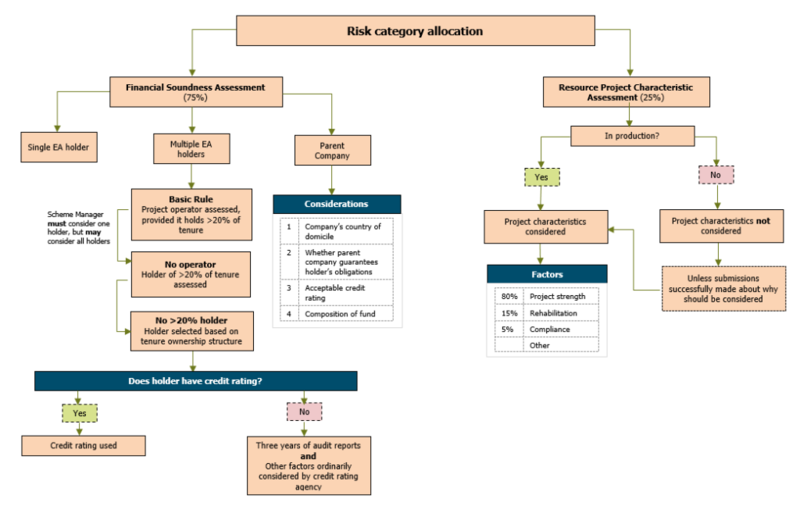 In allocating a resource project to a risk category, the Scheme Manager must consider, among other things, the probability of the State incurring costs because the project has not prevented or minimised environmental harm, or rehabilitated the affected environment. may consider a resource project characteristic assessment (RPCA) of the project, and any other matter considered relevant. Where there is more than one holder of an EA, the Scheme Manager must 'assign' the EA to only one of the holders – the 'relevant holder'. In making a decision on financial soundness of the relevant holder for the purposes of the risk allocation, the Scheme Manager may take into account the financial soundness of any or all of the holders, and their parent companies. The assignment of an EA to one holder is only relevant in determining whether a surety is required to preserve the financial viability of the fund. Risk allocation decisions must be made annually, although certain events trigger a requirement for a new risk allocation decision, for example where an application is made to transfer the resource authority, or a share in the resource authority, to which the EA relates. The revised draft guidelines clarify that the Scheme Manager must consider the FSA and RPCA on a weighting of 75% and 25% respectively. The Department has made it clear that these weights are a general guide only, and other quantitative and qualitative factors may be applied to this assessment where necessary to ensure that the risk category allocated is appropriate, taking into account all relevant factors. EA holders will have an opportunity to make submissions to the Scheme Manager regarding a project's initial risk category based on the particular circumstances, including on why the resource project characteristics should be taken into account. EA holders therefore should be prepared to meet a high evidentiary onus to prove to the Scheme Manager the estimated rehabilitation costs of a project. It is clear that greater importance will be afforded to the financial soundness of an EA holder, compared to the particular characteristics of a resource project. In assessing financial soundness, the Scheme Manager will first look to see if the EA holder or its parent has a long term credit rating from a Treasury-approved ratings agency. Where there is no credit rating, the Scheme Manager will seek from the holder three years of audited financial statements. The rigour of the FSA means that the new scheme presents challenges for emerging entrants who are more likely find that their initial risk allocation will result in having to provide surety. The characteristics of a resource project will not ordinarily be considered for a project that is not in production. This includes circumstances where a resource project is in the exploration, care and maintenance, or decommissioning phases, or the project has not been in production for an extended time due to other factors, such as a major weather event. As a basic rule, the Scheme Manager will take a risk averse approach when a site is not in production. However, an EA holder for the project may make submissions to the Scheme Manager on why these factors should be taken into account in the circumstances. The revised guidelines clarify that EA holders will be afforded the opportunity to justify to the Scheme Manager why a project has a low financial risk to the State even during care and maintenance, in light of the remaining economic life of the project or any relevant off-take agreements. As with FA decisions under the outgoing scheme, any decision in relation to the ERC can be internally reviewed by DES, and may be further appealed to the Land Court of Queensland. By contrast, the Scheme Manager's risk category allegation is not subject to appeal; any challenge is limited to narrow judicial review. As of 1 April 2019, all existing FA held by the State (through the Department of Natural Resources Mines and Energy) will automatically be taken to be the ERC for the relevant EA, and will be transferred to the Scheme Manager and deemed as a surety given by the EA holder. This ERC will apply to a project until the Scheme Manager issues existing EA holders with a 'transition notice', at which time the Scheme Manager will make an initial risk allocation for the project. Whilst the Scheme Manager must transition all existing EA holders by 1 April 2022, the Queensland Treasury has been seeking expressions of interest from holders with an ERC of $100,000 or more, to transition to the new scheme within the first six months. wish to have certainty of having been allocated to an initial risk category. EA holders should consider their taxation and financial circumstances to inform any decision to transition to the scheme early. With the Scheme about to commence, DES is expected to shortly publish the ERC calculator, ERC Guideline and other supporting material. This material will hopefully provide clarity on the proposition that the ERC calculation should include a 10 per cent contingency. Where an EA holder has a 'high' risk rating, it will generally be required to put up a surety, similarly to the previous FA payment, but with the added option of an insurance bond. As noted above, surety will also have to be provided where an entity has ERC above the Scheme threshold. Insurance bonds from 'a prescribed insurer' are now available as another avenue by which EA holders may put up surety. Watch this space for a detailed analysis of the applicable legislative requirements, and the insurance market's response to these schemes in Queensland and elsewhere in Australia, from McCullough Robertson and Allegiant IRS. Whilst the recently released draft guidelines provide some much needed clarity on the operation of the MERFP Act, there is still a long way to go before it is clear exactly how the resources industry will adjust to the reforms in practice. In a future publication, we will go into detail about the preparations necessary for proponents who are considering entering, or who are forced by circumstance into, the new financial provisioning scheme. We look forward to doing so with the certainty of the new Scheme Manager's final published guidelines and the ERC Calculator and guideline from DES.